The repair of a USB flash drive has its own features. The good news are that unlike SD cards these devices are maintainable. Therefore, if you can't replace your pen stick on a warranty, why don't you use 60-70% chance and repair it? In this article we're going to consider different cases and typical issues associated with the breakdown of USB flash drives, as well as options of their solution. Data recovery or flash stick repair? Recovering data or repairing a USB flash drive? It's not the same, although the concepts are quite related. be available for reading data writing. As a result of repairing a pen drive you can easily lose all the data stored on it, even though you will still be able to read it and write data on it. File recovery is possible only on a working flash stick. A flash stick is recognized as an unidentified USB device. It's incredibly easy to damage a USB flash drive. Like any physical device, flash memory can be a subject to external influences (such as strikes, thermal effects, ingress of water and etc.). In addition to this, there is a number of software errors due to which your USB flash drive can be out of order. Quite often the problem lies in the damaged pins of the controller and USB connector. How to check it. In order to check a pen stick for this problem, try using it with another computer. Or insert another pen stick (if there is any) in the USB port of the same computer. If other pen sticks can be easily read on your PC, the problem is probably in the storage device. If you can't read the data from your pen stick only on this computer, the problem may be in the USB sockets of the PC or laptop motherboard. A link to a third-party guide on how to repair a USB connector: Repairing the USB connector of a laptop by ourselves. If you don't want to dig into the wires, it's better to bring the PC or flash stick with a broken USB port to repair. The approximate cost of replacing a USB is $20 - 50. Most often the problem is in the controller of a flash stick which is the main link in the drive. The controller contains important chips, and disconnection of the contact or the burnout of legs will make data recovery from such flash stick a very problematic process. How to fix a USB flash drive. Replace the pen drive controller yourself (which is quite unrealistic to do at home). If the data stored on the flash stick is of great importance and you want to recover it, an expensive hardware and software complex for extracting the data bypassing the hardware controller can be used. Ask the workers of the company repairing flash sticks in your city for the cost of services. It can start from $30 and go up to $500 - 1000. USB flash drive contains a firmware which is a microcode with service data. If the firmware of a flash stick is damaged, it will inevitably stop working. How to fix it. Such flash stick can't be formatted via usual universal soft like SDFormatter., it will require a full “trepanation”, i.e. reflashing. This will require a firm utility from the manufacturer. However, you can reflash your flash stick only after figuring out the name of its controller. The difficulty lies in the fact that manufacturers usually use different types and models of controllers and can implement not only their own, but also others practices. Therefore, it's not always possible to immediately determine the type of your flash memory controller. Fortunately, there are special usb repair tools allowing you to determine the type of VID&PID* for the storage drives from Transcend, Silicon Power and etc. ; we're going to list them and provide the links to the installers. ChipEasy is a user friendly program that will help to retrieve a USB flash drive. It allows you to find out the manufacturer and model of your USB flash drive which will help you to reflash it. Mostly ChipEasy is applicable to Kingston and Transcend devices. Flash Drive information Extractor is an utility for gathering all the information necessary for repairing: The VID&PID of your controller, the model and type of your flash memory (for Silicon Power and other models). It differs in the amount of detail of the information provided on the device. CheckUDisk quickly scans the source and provides VID&PID for repairing a USB flash drive and its reanimation with the same amount of detail as CheckUDisk. You won't manage to find a firmware for a lot of storage devices. In such case, you can forget about repairing it yourself. As an option you can use the variant we've described above: a donor controller transplant. There is a number of flash stick problems that don't require repairing and can be solved via programs. In such cases, usually the system information on the stored data is corrupted: the size and title of a file, its directory structure, cluster size, file system and etc. Your flash stick should be as "clean" as possible when you open it in operating system. Restart your computer in safe mode. You can find useful software for fixing flash sticks (Apacer, HP, Kingston, Panasonic and etc.). We suggesting going through the website of your flash stick manufacturer, perhaps, there might be other software available. In case of a problem occurring, it's important to determine its symptoms and causes. This will help you to make the right decision and also it will save your time and nerves. Some people don't mind trying all the possible methods of repairing a pen stick and for some it might be easier to buy a new one and forget about it. In any case, we've given you all possible ways to repair a USB flash drive. If the described above methods aren't helpful and your flash stick still doesn't want to work, we suggesting going through other sections of our website: there is a plenty of other useful guides on repairing a USB flash drives and recovering a SD card. You're also welcome to ask questions via the feedback form and we will do our best to answer them. The connector of a usb drive not working, but 4 pins are alright and it was the board that went down. My sister had been using it for 2 days after it happened as she had no clue about it. The system shows the flash drive as a removable drive. There is nothing at the bottom. She didn't copy the files. Please help. The answer. It's unclear from the question which board exactly broke down. If it's a chip board, unfortunately it's impossible to repair it. If your USB flash drive connector broke down, you can replace it. The only thing you need is to know how to use a soldering iron. Well, and a soldering iron itself. 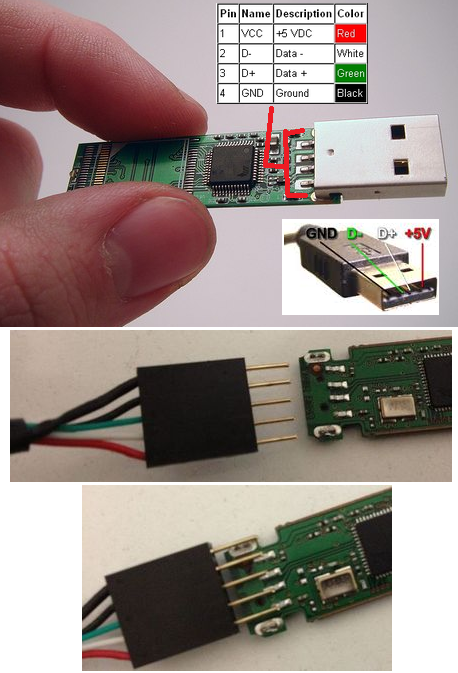 Here you can look at the scheme of the pins of a USB flash drive board. My micro pen stick (32GB) broke in half. How can I recover the information from it? Please tell me where to go and who can help me to fix it? The answer. Alas, but there is no way your pen stick can be repaired or somehow reanimated. If the problem was in its firmware, then there could be some chances. As for physical damage, it all depends on the kind of damage. If the chips of flash memory are safe and sound, you can read the data from it via PC 3000 Flash reader and etc. If the files aren't of great importance, the most obvious solution is to buy a new microSD card. A flash stick won't open, it isn't recognized as a removable drive and it isn't shown in Device Manager. It's unlikely to happen due to physical impact, since there are 3 flash sticks with the same problem and with each of them different people were working. The answer. You haven't specified the type of memory you are working with. In any case, try working with it on other phones or devices to which it can be connected. If it's an sd card, connect it to your PC via a card reader. Check whether the connected device is shown in Device Manager. If yes, use any software for disk partitioning/ regular Windows tools or firm software for formatting a flash stick in NTFS or FAT available on the website of the manufacturer. During the formation of a pen stick (transcend) it was pulled out from a PC. It was quite obvious that it won't be working any more and testing only confirmed it. The computer doesn't see it, the indicator of the pen stick blinks all the time, it can't be seen in "My Computer", but it's shown in Device Manager as a device that works normally and is recognized as a storage drive. The answer. Probably, its file table is damaged. You can still repair your pen stick by creating a partition and formatting it. As it has already been mentioned, you can retrieve it via special tools such as Acronis Disc Director, but it's better to use TestDisk app. I have a JetFlash Transcend 8GB USB flash drive. Which can no longer be recognized by the system. I formatted it via JetFlash Online Recovery program and it deleted all the data. Is there a chance to recover the data stored on the USB flash drive? The answer. Unformat program is suitable for recovering Transcend USB flash drives. The chances of recovery depend on the depth of formatting: Full or Quick. Anyway, try the deep scan option (you can find it in Recuva).